The most dramatic changes in the yard began after Fred retired in 2002! The floodlight was removed; drainage and irrigation ditches were dug; irrigation system was installed; patio and sidewalks were installed; and finally at the end of the year the patio cover was built. And that was just the backyard! The pole in photo 1 (next to the irises) is the floodlight that had to be removed. The electrical wires going to it were cut before I moved in, so it was useless and just got in the way. 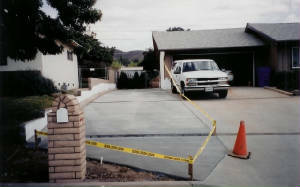 Whoever installed it with all that cement (photo 2) wanted to be sure it would never blow over! It was a real challenge for Fred to dig it out and then break it up into small enough pieces to dispose of. Good riddance! 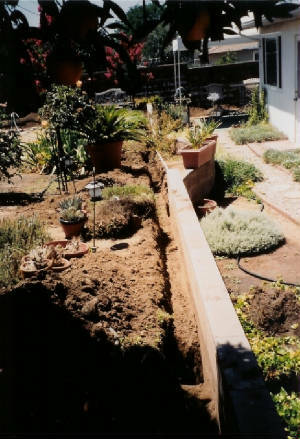 Photo 3 is representative of the many irrigation and drainage ditches that had to be dug. I'm glad I was still working! 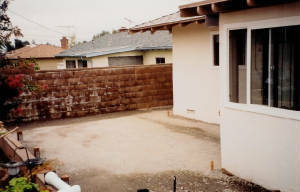 All the gravel was removed and the ground surface was prepared for laying the patio pavers (photo 4). While I tried to have as many things transplanted as possible, some things couldn't be saved. This was a huge job, so we hired a local company to do the work while Fred watched to be sure it was done the way we wanted it to be. 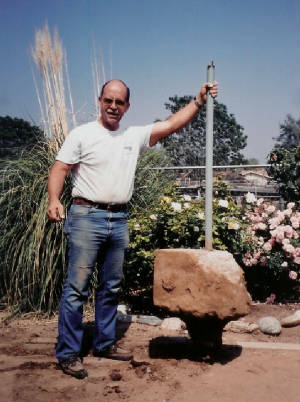 They first dug down about seven inches with a bobcat, then filled it with four inches of a base gravel (ironic, isn't it!). After that, they added a couple of inches of sand as the final layer before the pavers are set in. 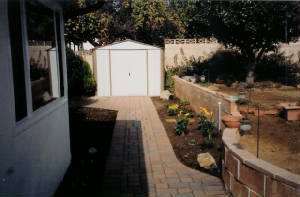 Photo 5 shows our new sidewalk, the new shed, and some newly-planted calla lilies and mums at the base of the wall. It's September, and things are really taking shape! Shortly after that, we had the graveled side yard paved so we could more easily park the camper trailer we had at that time. Photo 6 shows the end result. 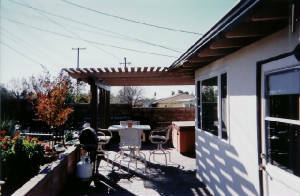 In November, Fred began building the patio cover and completed it in December just before the holidays. See photo 7.